View from the north. 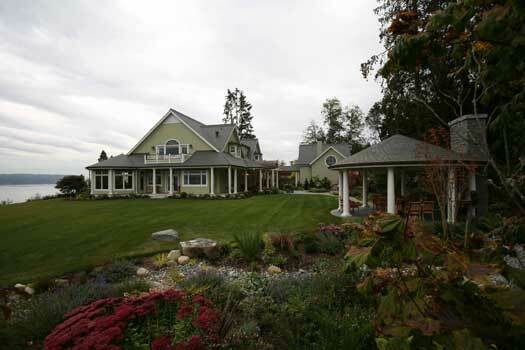 On the left corner of the house is a rotunda with a 270-degree view of Saratoga Passage and the North Cascades. This project is the first of several phases planned for this site, a 10-acre peninsula jutting out into Saratoga Passage, on the east side of Whidbey Island. 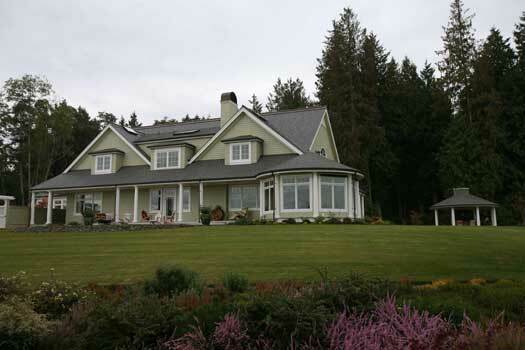 The client is a well known mystery writer who relocated to the Puget Sound area and selected the forested site for its seclusion and beautiful views of the water, Mt. Baker, and the North Cascades. 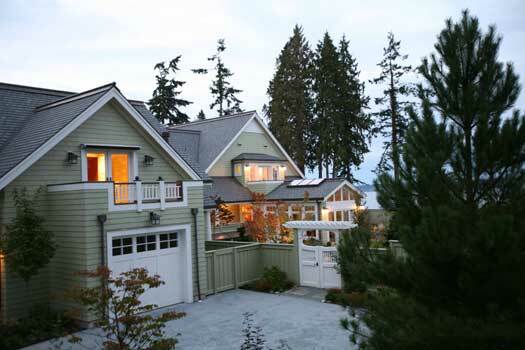 Built so far is a two-story home connected by a breezeway to a pavilion with a garage, workshop, and office suite. Other amenities include an enclosed garden, a potting shed, a gazebo with fireplace and BBQ, and a forested park with walking trail. Future phases will include a guest house, a large workshop styled as a barn, and a tram to the property’s private beach at the foot of the bluff. 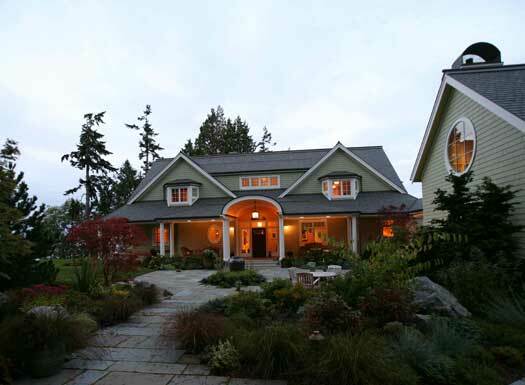 Adapt to a Northwest setting a traditional Hamptons-style shingled country house with formal elements such as a colonnaded screened verandah and turret. Position the house for privacy and to take full advantage of the views. Open as much window space as possible. Within the house, create an open, relaxed space for entertaining, while maintaining the privacy of the intimate living quarters. Display a personal art collection. Build an office suite separate from the living quarters, yet conveniently accessible, to accommodate an employee and business visits without sacrificing privacy. 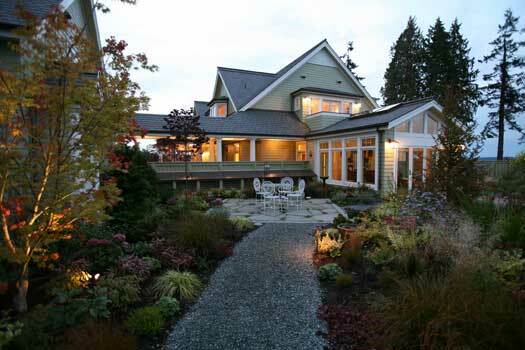 Create an intimate garden separate from other landscaping and the forested areas. The design reinterprets the original Hamptons concept with an open colonnaded porch instead of a screened verandah, as insects are not an issue in this region. The turret was transformed into a view rotunda, an 18-foot diameter extension of the living room with 270-degree vistas. 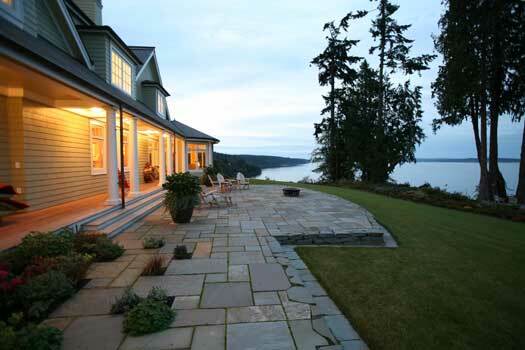 It anchors the house on the site’s best view point, near the edge of the bluff. A 900-foot gravel driveway winds from a remote-controlled gate at the county road through a groomed forest park to provide privacy for the more developed part of the site. In addition, berms were raised for privacy around the landward side of the structures and landscaped with drought-tolerant plants. The main level of the two-story home has an open floor plan for the living, dining, and kitchen areas, with large view windows. Guests can move casually between spaces, which are defined with ceiling treatments, such as moldings and coffers, and portal-like transitions that do not impede circulation or sightlines. 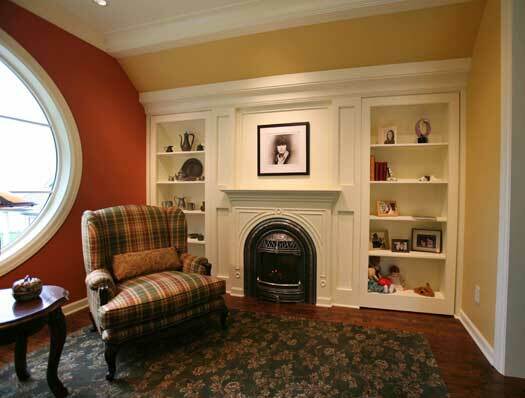 Other rooms on the main level include a mudroom, conservatory, and library. The private living quarters are upstairs, accessible through a discreet stairway. 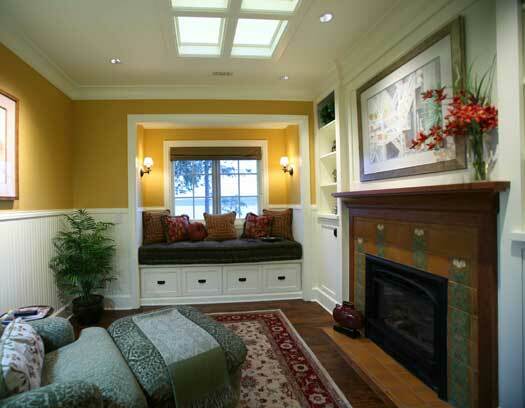 This solution dovetailed with another modification of the traditional design. Instead of a formal entry with grand staircase, the entry is an art gallery. This approach allowed the creation of interior walls for display, while maintaining an open plan for the main spaces and using the exterior walls for windows. The upper level includes a master suite (entry, bedroom, sitting room, bath, linen closets and dressing room), an exercise room and bath, craft room, and morning room. A separate pavilion houses car garages, gas boilers for radiant floor heating, a shop, a secondary garage for lawn equipment, and an upstairs office suite with a main office, an assistant’s office, sitting room, 3/4 bath, and kitchenette. A breezeway offers convenient, protected access from one building to the other. 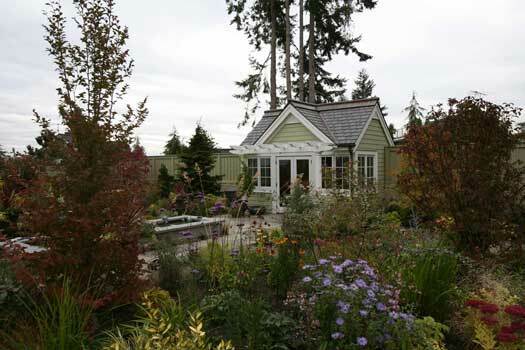 Behind the house is a fully enclosed English-style garden, with two main gates, a potting shed, and a stone-lined basin. All plantings are drought tolerant. 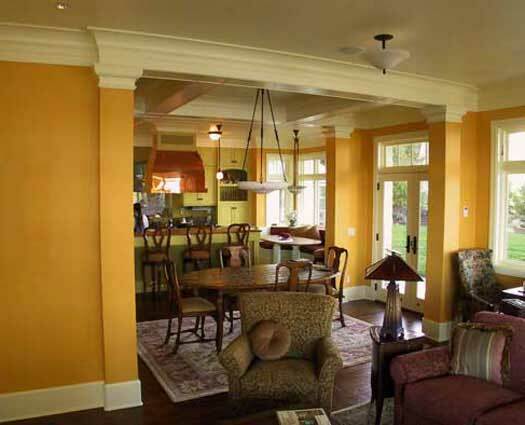 The entire project features custom details, including, for example, doric columns and post-and-beam treatments, ironwood flooring on the porch with corner weaved patterns, ceiling-height cherry bookcases in the library, an English clay kitchen sink, and a padded dog nook in the kitchen. Everywhere you turn, there is something special to see or touch. All electronics (video and audio systems, computers, etc.) are concealed, many of them in a dedicated utility basement. Behind the house is a conservatory looking out on an enclosed English-style garden with a basin (left). 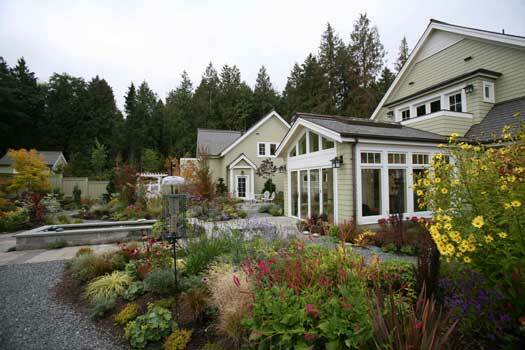 Landscaping is drought tolerant. The potting shed, at the back of the garden, features a trellised portal that aligns with the basin and conservatory. A view of the patio along the colonnaded porch, looking toward the rotunda and north at Saratoga Passage. A view from the garden of the conservatory (right) and the breezeway (center) connecting the house and the garage-office pavilion (left). Built into the breezeway is a covered dog run, allowing two small dogs free passage between the house and the office while protecting them from eagles and other predators. The main garden gate (center) and the lawnmower bay (left) in the garage-office pavilion. View of the main entrance from the north. To the right is the garage-office pavilion. 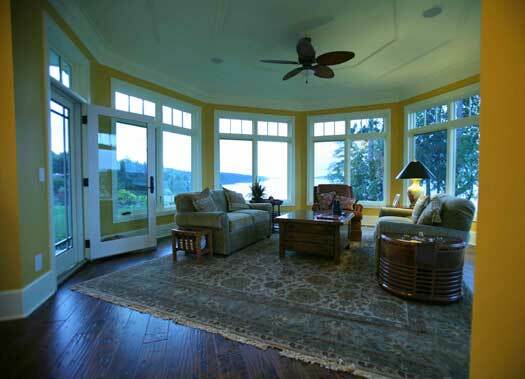 The round window (right) offers a view of Saratoga Passage from the upstairs office sitting room. The main entrance straight on. The colonnaded porch wraps around the house on both sides. 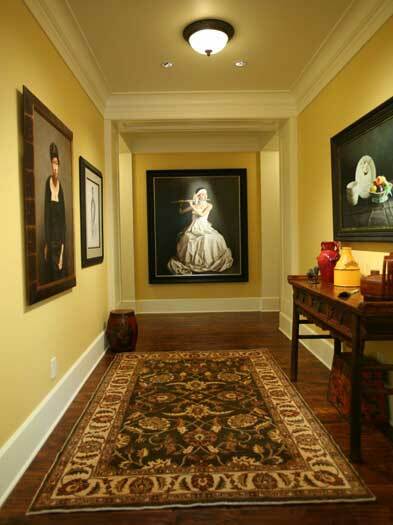 The entry hall and transition to the main living area is a gallery displaying part of the owner’s art collection. Paintings are highlighted with low-voltage lighting. The living room fireplace, seen from the direction of the dining area. The window overlooks the porch and patio to the view beyond. The view rotunda, at the northeastern corner of the house, is 18 feet wide with 270-degree vistas, taking full advantage of the site, a peninsula overlooking Saratoga Passage. The dining area and kitchen beyond, seen from the direction of the living room. Ceilings are 10 feet high. 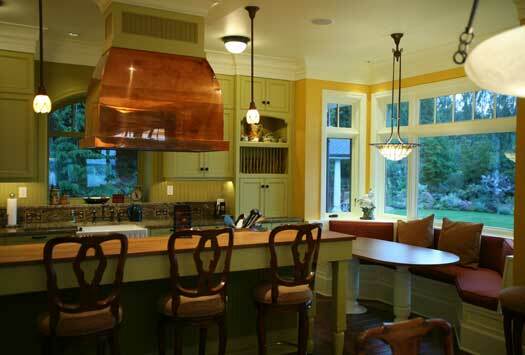 The kitchen is organized around a copper vent hood over an AGA gas range on an island, and includes a window bay seat for casual dining. 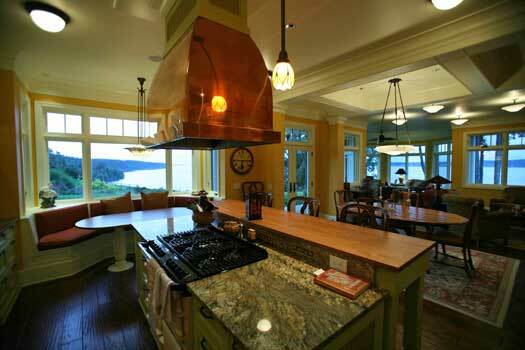 View from the kitchen of the dining area and its transition into the rotunda, far in the back. 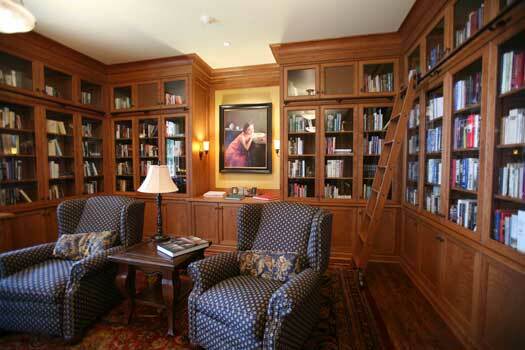 The owner is a well known mystery writer and made a priority of creating a beautiful library. Custom cherry-wood, glass-doored bookcases line three of the four walls. Also featured is part of the art collection. View of the library fireplace. 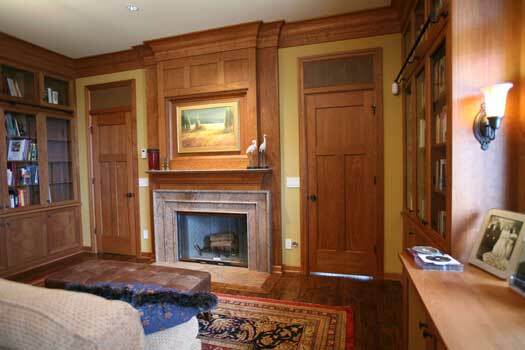 The painting above the mantel hangs on a panel that slides up to reveal a flat-screen TV. 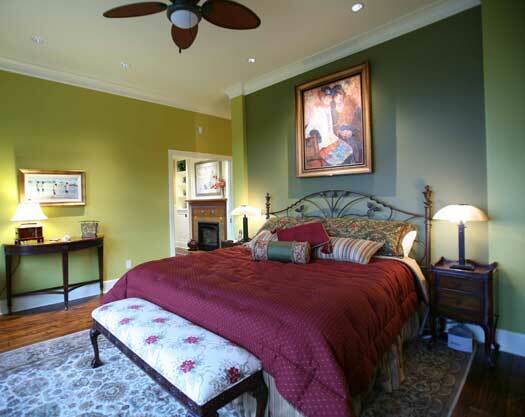 The bedroom is part of a master suite featuring an entry hall, sitting room, dressing room and linen closet, a second linen closet, and bath area. The sitting-room fireplace is in the background doorway. The fireplace and window bay seat in the master suite sitting room. 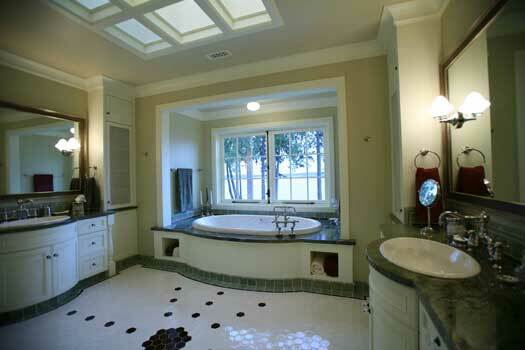 The master bath area includes opposing vanities and large jetted tub in a view bay (shown here) along with a double walk-in shower and separate toilet room. 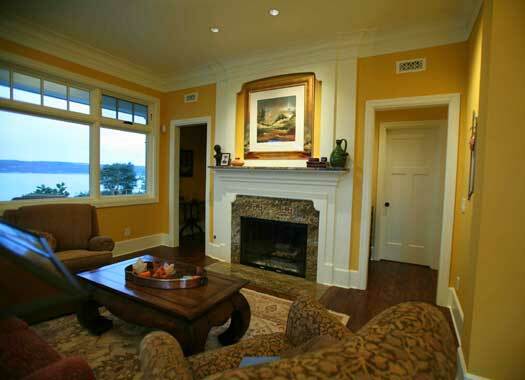 The office sitting room features a large round window (left) overlooking the landscaped grounds and Saratoga Passage.